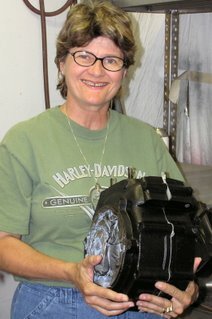 This first picture is one of Debbie holding her Motor, or at least the bottom half of it. 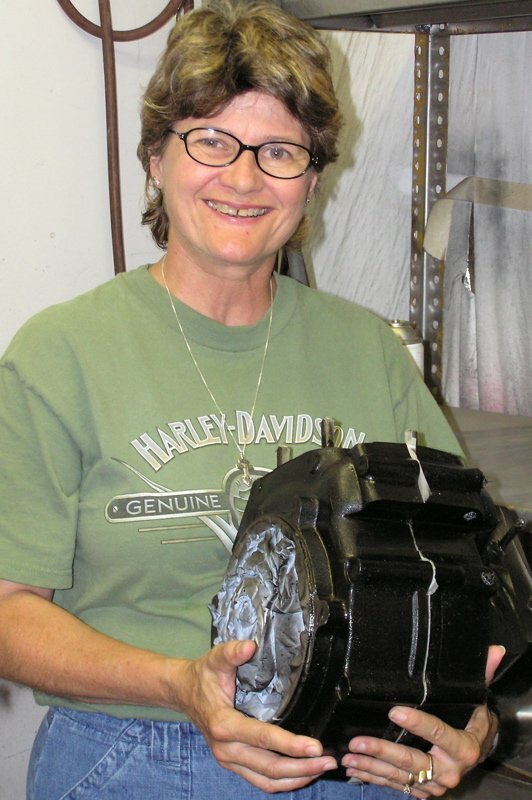 She had the engine balanced by Tom Elrod, a well known racer and engine tuner in the Austin Area. She had just finished the painting the two halves of the cases black. Naturally this is a pretty old picture, she has finished rebuilding the motor now, and it is in the frame. 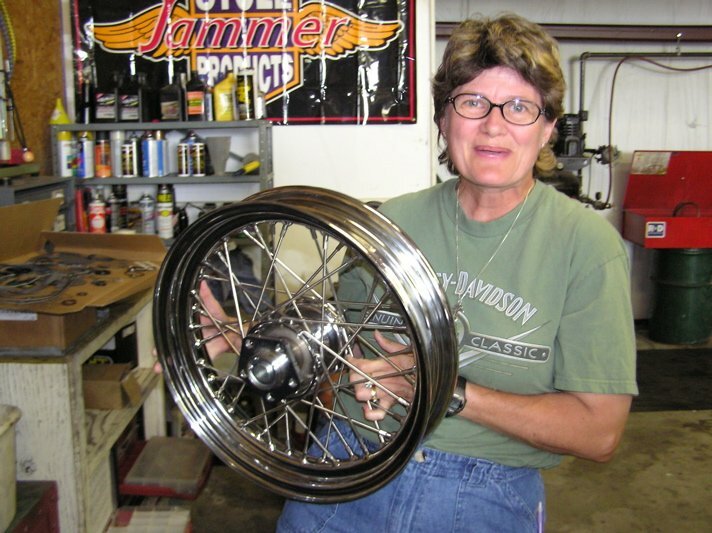 The second picture is her brand new chrome spoked rear wheel. It is a bit heavy, but she is a proud owner. I have added several more newsletter articles to the list in the blog. Some for December and January 2003, and even a few from Debbie when she was VP. Look for Veep’s Peeps, which was debbie’s article title. Also added June 2004, and June 2005. If you are a Brown, a Cochran, or a Zimmer, or related to any of the other last names mentioned in the book, you might find it worth a look. I have to warn you that this book is over a 100 pages in length, and it will take me several weeks if not months to transcribe it. Apparently 50 copies of the book were printed and distributed to relatives, so if you happen to have a copy of it, and want to participate in this project, you are welcome to contact me and volunteer to type in some of the chapters. You can then email them to me for posting. 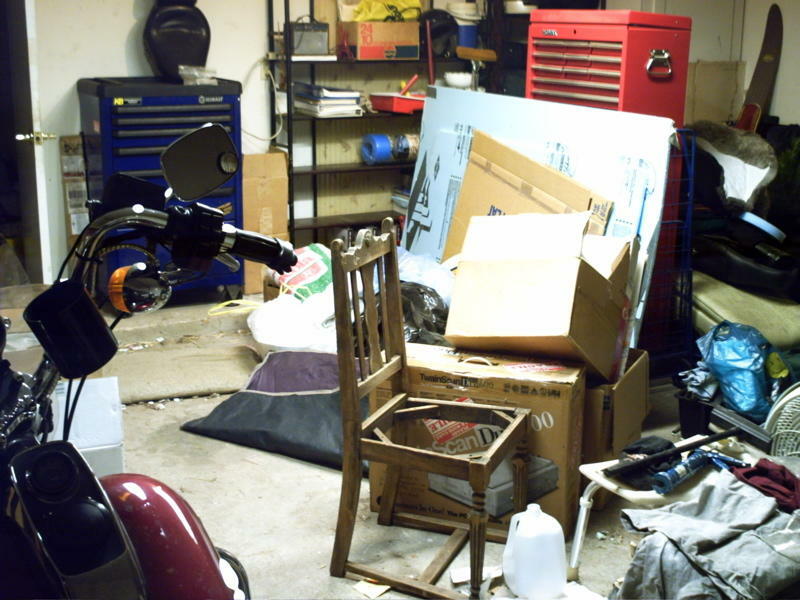 Well, we just completed almost a whole day of cleaning the garage, for the first time since we moved into the house about 10 years ago. 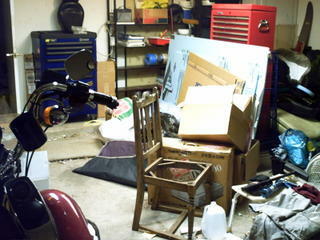 We wouldn’t have done it now, except we need to make room for Miracle, Debbie’s ’73 FLH Harley Davidson. I know it doesn’t look like we cleaned, but we had to stack all the trash in the open space while we wait for trash pickup day, then there will be a noce open space for miracle. The shop where Debbie has been working on Miracle is now closed, and Miracle is sitting in a friends garage up in Liberty Hill, waiting for someone to give her some attention. So, we are clearing out a place for Miracle, so we can start to make some progress on the remaining things that need to be done. 1. Wiring harness needs to be built or bought. 2. Buy and install the rear hydrolic lifter in the rear cylinder. We have one, but it doesn’t fit,. It is a long story. 3. Fix the front left fork tube seal so it doesn’t leak. 4. Get the sheet metal painted. Debbie will have to pick a color scheme as well. 5. Get Miracle registered. hopefully this won’t be a problem, but since the frame ID tag is partially obliterated, it might be. There really isn’t much left, we just need to get to it. 19 Though I am free and belong to no man, I make myself a slave to everyone, to win as many as possible. 20 To the Jews I became like a Jew, to win the Jews. To those under the law I became like one under the law (though I myself am not under the law), so as to win those under the law. 21 To those not having the law I became like one not having the law (though I am not free from God’s law but am under Christ’s law), so as to win those not having the law. 22 To the weak I became weak, to win the weak. I have become all things to all men so that by all possible means I might save some. 23 I do all this for the sake of the gospel, that I may share in its blessings. 19 Though I am free and belong to no man, I make myself a slave to everyone, to win as many as possible. 20 To the Jews I became like a Jew, to win the Jews. To those under the law I became like one under the law (though I myself am not under the law), so as to win those under the law. 21 To those not having the law I became like one not having the law (though I am not free from God’s law but am under Christ’s law), so as to win those not having the law. 22 To the weak I became weak, to win the weak. I have become all things to all men so that by all possible means I might save some. 23 I do all this for the sake of the gospel, that I may share in its blessings. Paul was a true fanatic, he did not let anything stand in his way of persuing the mission Christ gave him. Am I saying I am there? No, but I am on the way. I think that God will use you, and me if we really want it. I mean REALLY want it, not like I might want an pizza, or a bowl of ice cream, I mean want it like I can’t breath, or want it so much that my hands shake just thinking about it. I am talking true fanaticism, I want to know and to be used by God like there is no other thing in this world that is more important, because there isn’t!